The list of things us ladies have to do before we get out the door every morning is basically the longest, most exhausting list known to mankind (or should I say 'womankind'?). Pluck eyebrows, color roots, paint nails, apply makeup, lather up with lotion, style hair.....can I go back to just being a tomboy?! Obviously with so much to do it can be easy to get into a (boring) routine, especially when it comes to hair. My morning hair routine dialogue usually goes a little something like "Ugh I hate my hair! Why is my hair not doing anything I want it to do? $67%$$*&t&5& (lots of expletives)!!!! No one invited you to this hair party frizz! Whatever! I'll just put it up into a messy bun like I do every.single.day!" Clearly, I need help. Enter these 3 ways to update a ponytail. They are by no means anything new or extraordinary but they are a great reminder that hair doesn't have to be boring or complicated and it most certainly doesn't have to be in a rut. Ponytail with Hair Twist // Style your hair into a ponytail as you normally would. From one side, section off a small (about 1/4" to 1/2") piece of hair. Wrap it around your ponytail elastic. When you get to the hair ends secure them underneath your ponytail with a bobby pin. 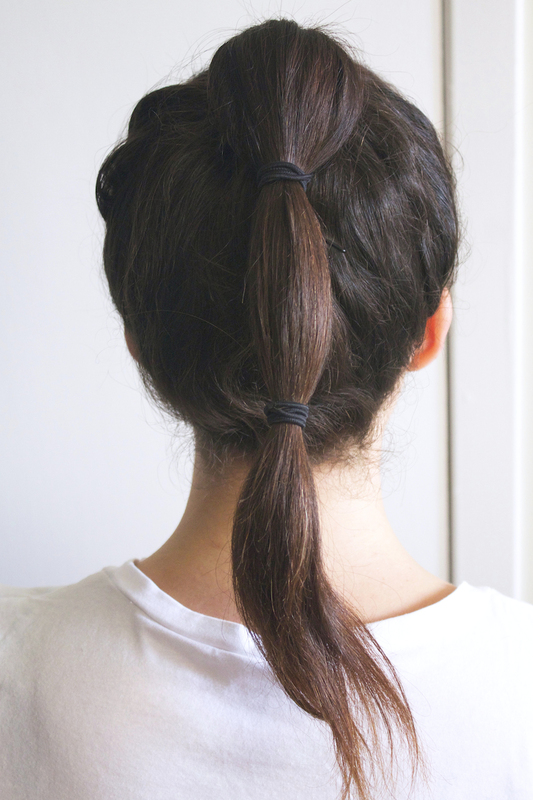 Ponytail Braid // Style your hair into a ponytail as you normally would. Gently braid your hair, then secure the end with a hair elastic. Jasmine Ponytail // Style your hair into a ponytail as you normally would. Then, about every 2-3" add another hair elastic. Continue adding hair elastics until you have only 2-3" left at the end (for my hair I use 2-3 hair ties, depending on how I want them spaced).